Cancellation: do it before 2 weeks prior the check in date. After 10pm we try to keep the whole hostel quite. 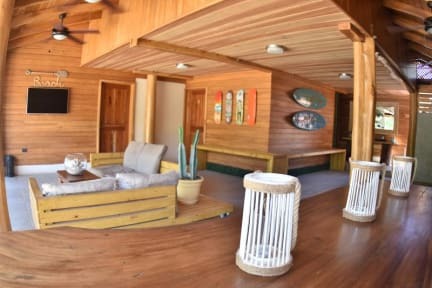 Built in 2015, with fine woods and stone bathrooms, Casa Aura will give you the perfect feeling of a beach house were you wont have to worry about anything. The property have an outdoor terrace surrounded by palm trees and hammocks. Casa Aura is one of the few beach front properties in the heart of Tamarindo, steps away from restaurants, supermarkets, etc. 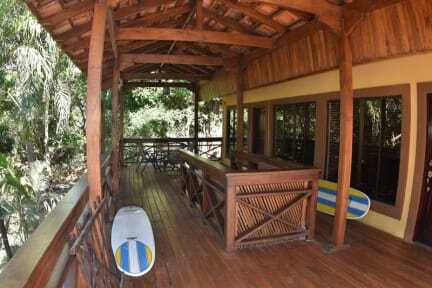 Playa Conchal is 11 km from Casa Aura, while Playa Hermosa is 35 km away. We have 5 en suite rooms and two, 2 bedroom apartments that can lodge from 4 person up to groups of 10 people. The tax is included in the price of the room. Casa Aura is excellent place to stay for any traveler. The staff is excellent and accommodating, and the common space is perfect. I would definitely recommend to others. Perfectly clean, chill vibe, comfortable beds and excellent air conditioning in the dorm room. Would definitely recommend. We stayed in the 2 bedroom apartment. The room was clean and the kitchen had the basic essentials. There is some road noise in the room but the deck area is very nice with an ocean view and hammocks. The individual rooms in the apartment don't lock, which I found odd. The breakfast was excellent! perfect location with a great ambiance and beach access. Only bummer was no locker in the dorm but you can leave your valuables at the front desk. Overall great experience, the beds were confortable, the place was clean, the staff really helpful and it’s right in front of the beach! The only thing was that there was no locker only a little box downstairs kept with the staff to keep our important belongings which was not really practical. Also, there was only 1 bathroom in each bedroom and none in the common area, being 6 strangers in the same room, it was pretty inconvenient.